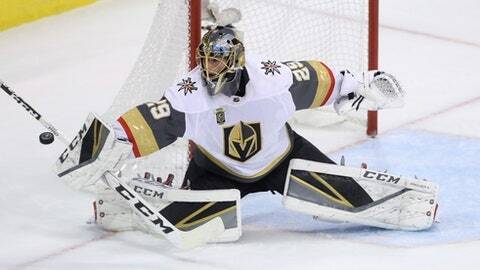 LAS VEGAS (AP) Marc-Andre Fleury has been the foundation for the Vegas Golden Knights‘ run to the Stanley Cup Final. Yet while he has a 1.68 goals-against average and .947 save percentage, he’ll be the first one in the locker room to credit the defensemen in front of him. ”It’s a team game – win as a team, lose as a team,” said Fleury, who looks to become the 11th goaltender in NHL history to have his name on the Cup at least four times – and the fourth of that group to win with multiple teams. The pairings of Nate Schmidt and Brayden McNabb, Shea Theodore and Deryk Engelland, and Colin Miller with Luca Sbisa or Jon Merrill, have helped the Golden Knights become a very tight defensive team during the playoffs, something that will have to carry into Game 1 at T-Mobile Arena, on Monday against the Washington Capitals. Schmidt has developed into the team’s top defenseman after struggling to find consistent ice time in Washington last season, when he averaged 15:29 on the ice. The fifth-year pro leads the Golden Knights with an average 22:14 on the ice and brings a familiarity to the Final, having played with Washington’s top scorers Evgeny Kuznetsov (24 points) and Alex Ovechkin (22), who rank first and second, respectively, in overall playoff scoring. The Golden Knights swept the regular-season series against Washington, winning 3-0 on Dec. 23 in Vegas and 4-3 on Feb. 4 in D.C.
With five more Capitals have double-digit points – Nicklas Backstrom (16), John Carlson (16), T.J. Oshie (15), Lars Eller (13) and Tom Wilson (11) – Vegas will need one last big effort from a defensive group that has helped allow the second-least number of goals among playoff teams that have played 10 games. Washington coach Barry Trotz said he knows the Golden Knights have three dynamic duos that each feature one offensive guy who can skate and move the puck – that being Miller, Theodore, and Schmidt – paired with more of a traditional stay-at-home defenseman who isn’t afraid to get physical, block shots and slow the opposing team’s pace – such as Sbisa, Engelland, Merrill and McNabb. Schmidt said using speed against them worked during the regular season, by moving their feet more than Washington did, and helping to develop plays in transition. But again, this is the Stanley Cup Final, and Schmidt said he knows Washington can skate well and will be a challenge. To Vegas’ credit, however, it does have the fourth-best penalty kill in the playoffs, stopping 82.5 percent of the power plays it has seen. And, as Sbisa said, that circles back to Fleury and the chemistry that’s been built with the defensive pairings. ”That bond is definitely there,” Sbisa said. ”You don’t have to worry about anything else, play it loose, play to your strengths and that’s what we’ve been doing as a group. The six Ds that are playing that night, they’re tight; we play as a three-man group (with Fleury). Flower’s a guy that doesn’t take too much credit for himself, even though he should, because he’s been that good and it’s obviously nice to hear stuff like that coming out of his mouth. But he definitely deserves all the credit here.